With a basic understanding of pool chemistry, understanding the air quality problems of indoor pools becomes much easier. The two sides of the equation–water chemistry and air handling–are both critical to achieving healthy indoor air quality (IAQ) in a swimming pool. This is a multi-part article, so let's first talk about the chemistry of keeping water clean and safe. This article is a brief overview of what is going on in the water. If you want a deeper dive into the chemistry aspects, we invite you to read our sources, which we have hyperlinked to throughout the article. Chlorine is the most commonly used sanitizer in the swimming pool industry, by far. Chlorine is an excellent sanitizer and disinfectant, and a moderately decent oxidizer too. Compared to its efficacy as a sanitizer, chlorine is a relatively weak oxidizer. We can compare chlorine to stronger oxidizers such as ozone, hydroxyl radicals, hydrogen peroxide and others using the chart below from this source. 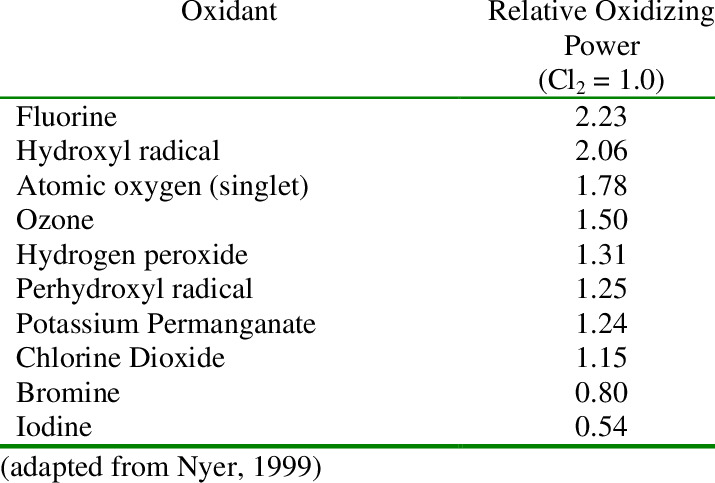 This chart shows relative strength of these oxidizers compared to Cl2, chlorine. As you can see, the chart compares these other oxidizers to chlorine. Ozone is 1.5x stronger. Hydroxyl radicals are 2.06x stronger. Bromine is a 20% weaker oxidizer than chlorine. We share this only to illustrate a point: chlorine is not used in pools because of its oxidation power; rather it is used because of its undeniable strength as a sanitizer and disinfectant. So what's the difference between sanitation, disinfection and oxidation? The efficacy of a sanitizer is gauged on its ability to reduce the contamination level within a specified amount of time, not necessarily eliminate it entirely. In terms of public health, that standard is generally accepted as 99.9%, a 3-log reduction in contaminants within 30 seconds. For food contact surfaces, that standard is 99.999%, a 5-log reduction. For pool sanitization, we need water to be safe enough to be in direct contact with. Disinfection, unlike sanitation, means destroying (or inactivating) every infectious microorganism. In the swimming pool business, just think of it this way. Sanitation means to kill any microorganisms to at least a 3-log reduction, and disinfection means to kill disease causing microorganisms completely, within a span of 10 minutes. Fortunately, hypochlorous acid (HOCl), the strong form of chlorine in water, is very good at doing both disinfection and sanitation in swimming pools. Oxidation is the process of taking an electron from a molecule, and sometimes replacing it with oxygen. Reduction is what occurs when a substance gains an electron, which is confusing, because it sounds opposite. The acronym to remember for this is OILRIG. Oxidation Is Loss, Reduction Is Gain. We call these reactions redox reactions, for reduction/oxidation. In swimming pools, oxidation is a term broadly used for removing contaminants that are non-living, like bather waste and metals. If contaminants are living, the process would be sanitation or disinfection. Oxidation is how chlorine 'burns up' non-living organics like sweat, mucous, body oils, urine, saliva, and bather products like cosmetics, sunscreen, lotions, deodorants, etc. So think of it like this: pool sanitization and disinfection kill living microorganisms and contaminants, while oxidation handles non-living contaminants. Since chlorine is such a phenomenal sanitizer and disinfectant, it rarely needs help keeping bacteria under control. There are several things that can weaken chlorine, however. Things like higher pH, too much cyanuric acid, or chlorine simply has too much to manage and depleted. When chlorine falls short, it needs help conquering the oxidant demand. This process, in short, is known as breakpoint chlorination. The first thing chlorine goes after is metals, which it oxidizes. That's up to point (A). Chlorine is reduced by these metals, and then begins oxidizing nitrogen and carbon-based contaminants. Carbon-based contaminants are primarily bather waste and other non-living organics. Quality enzymes can break down and digest these substances with ease, which is why we strongly recommend using enzymes in commercial swimming pools. Enzymes take an enormous amount of the non-living organic burden off of chlorine, so it is freed up to do what it does best: pool sanitization and disinfection. Nitrogen, is much harder to remove. Chlorine combines with nitrogen compounds like ammonia, nitrates and others to eventually break them down and off-gas byproducts into the air. It's nasty stuff, and nitrogen compounds are the root cause of chloramines. Chloramines (monochloramine, dichloramine and trichloramine) are just three of several hundred types of disinfection byproducts (DBPs) that are formed when chlorine attacks nitrogen. The most common form of nitrogen in this context is ammonia, the primary component of urea, which is found in our urine and sweat. Chlorine could use some help in high-use swimming pools. Secondary systems such as Ultraviolet light (UV) and Ozone are common. UV deactivates contaminants including some combined chloro-organics like monochloramine. Ozone is a secondary oxidizer with 1.5x the strength of chlorine, and can also help dramatically. Advanced Oxidation Process (AOP) systems are on the rise, as they combine UV and Ozone to create an even stronger oxidizer, hydroxyl radicals. All of these things are beneficial in managing water chemistry and combined chlorine. None of them, however, create a long lasting residual that can really impact things out in the swimming pool. They are basically point-of-contact systems, at the mercy of circulation. These systems can only impact the water that flows through them. Recently, a new secondary system has shown a lot of promise, and it is called Hyper-Dissolved Oxygen (HDO). HDO is dissolved into water as nano-bubbles, and can create a residual out in the pool itself. Without being certain of the exact science behind what is going on, it appears that high levels of oxygen help water quality and clarity. Could it be that this hyper-dissolved oxygen is helping chlorine out in the pool? Is it assisting in oxidation? We don't know, but this system's impact on indoor air quality is powerful, and undeniable. If you have indoor air quality concerns, it's probably a combination of water chemistry and air handling design. We can visit your facility and help diagnose it accurately. Contaminants that are living organisms need to be killed, via sanitization/disinfection. Non-living contaminants like carbon and nitrogen-based bather waste need to be oxidized. Chlorine has quite a burden on it, when you consider the vast majority of its job is oxidation. Chlorine is a relatively weak oxidizer compared to other oxidizers like ozone and hydroxyl radicals, and it is also weak compared to its strength as a sanitizer. 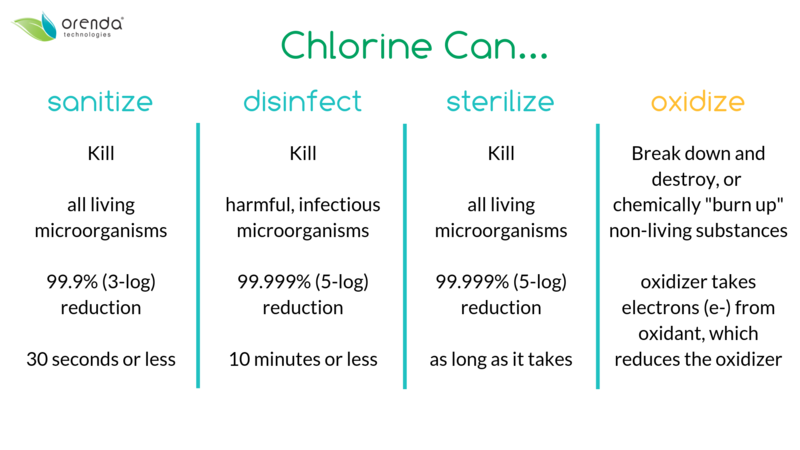 Is your pool relying solely on chlorine to stay clean of all contamination? If so, consider secondary systems to help, and/or enzymes to remove non-living organic waste. These things can dramatically improve chlorine efficiency and keep your water cleaner. In Part 2, we will discuss nitrogen more in depth.